My niece will be starting kindergarten in the fall and I want to capture some memories about her elementary years as a gift for my sister. This is the first mini album that I have designed. All my other albums have been made following instructions and plans created by others. I did use some of what I learned in those other albums and incorporated them in this one. It was really fun to use my imagination and create something new! Very rewarding feeling to finish it!! 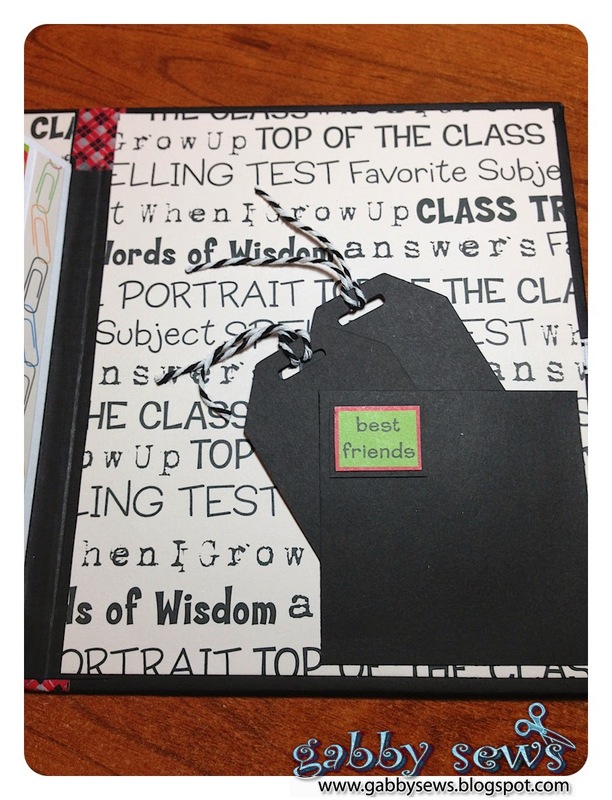 I had originally planned to use my Cinch to bind the album but it turned out to be way too thick - 4" total. 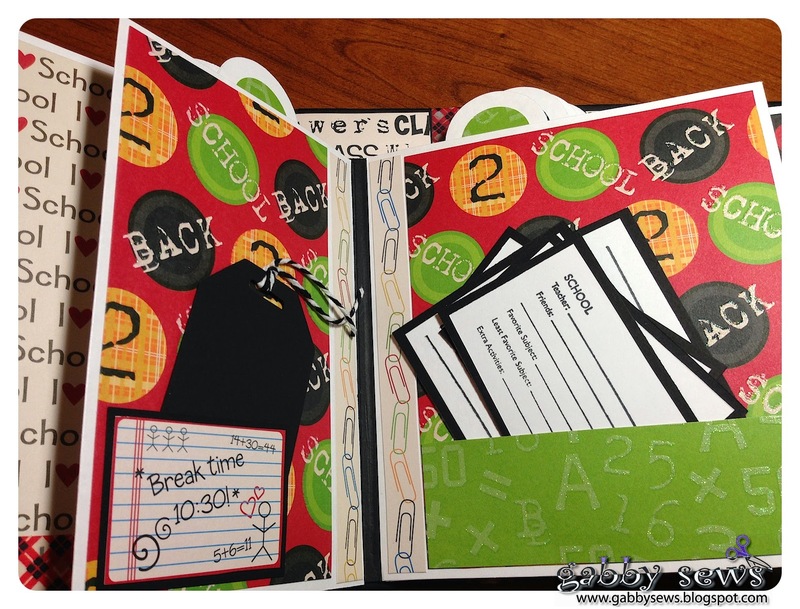 So I changed my plan and created a binding big enough using the Hidden Hinge Binding System created by Kathy Orta (you've got to check her out - she's a genius!). I ended up having to make one strip of page flanges from an 8.5X11 sheet of card stock and then use about 1/2 of another sheet to make more and then glue them together. I made my pages 1/8" apart and my flanges are all 3/8" tall. You can get 9 pages from one 8.5X11 sheet but I have 14 pages altogether. I wasn't sure it was going to work but in the end I'm happy with the result. The book did turn out larger than I ever thought it would but I don't think it looks too horribly strange. 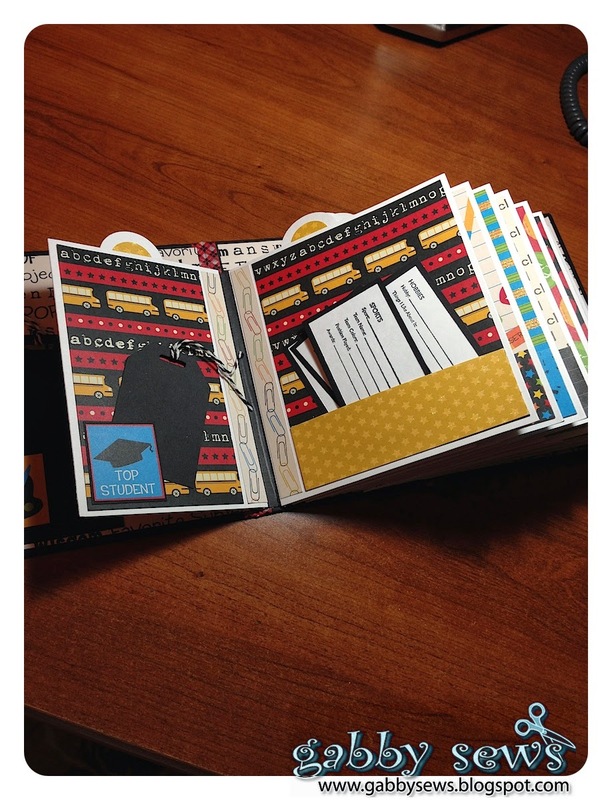 My covers and spine are made from heavy chipboard covered with Core'dinations card stock and then decorated with paper from the School Days collection from The Paper Studio (I used this same paper collection throughout the entire album). 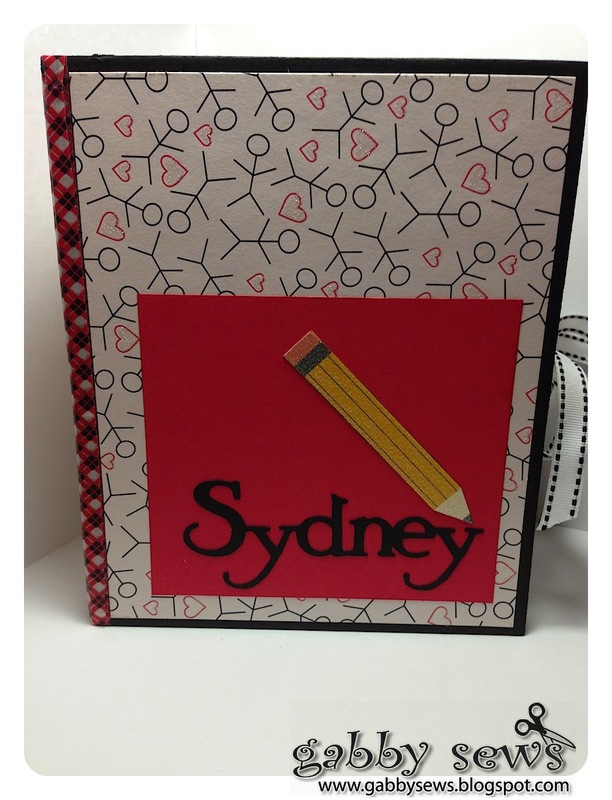 I cut out Sydney's name with my Cricut using the font from Paper Lace. I really like that font and it lends itself very well to using the weld feature. The pencil is actually cut from the cover of the paper collection. I don't think the pictures show it very well but the pencil is glittered as are several of the other papers from the collection. I used some American Crafts washi tape in a really cool plaid (reminds me of school uniforms) on the spine to give the bendable parts more strength. I also added some ribbon from my stash to keep it closed. 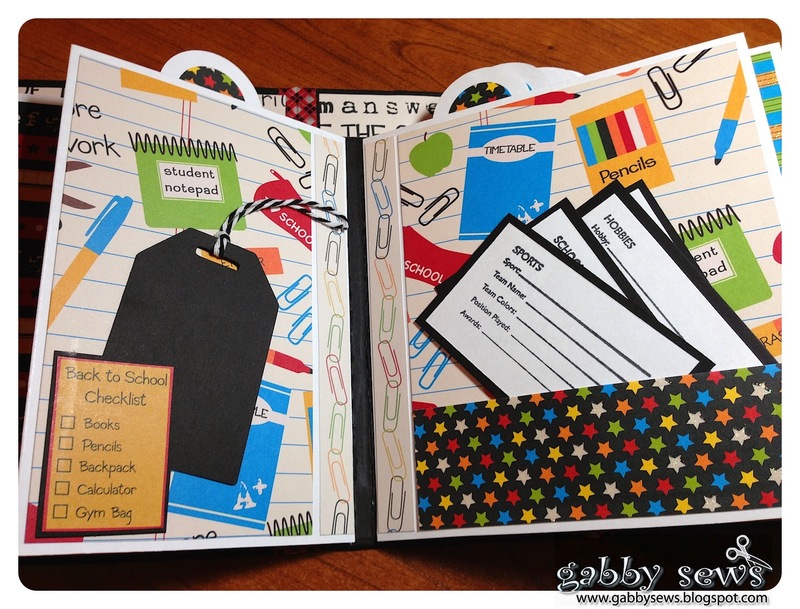 The album contains two pages (front and back) for each grade - kindergarten through sixth. The first page of each grade is the same except for the grade I stamped in the corner so I didn't take pictures of all of the first pages. 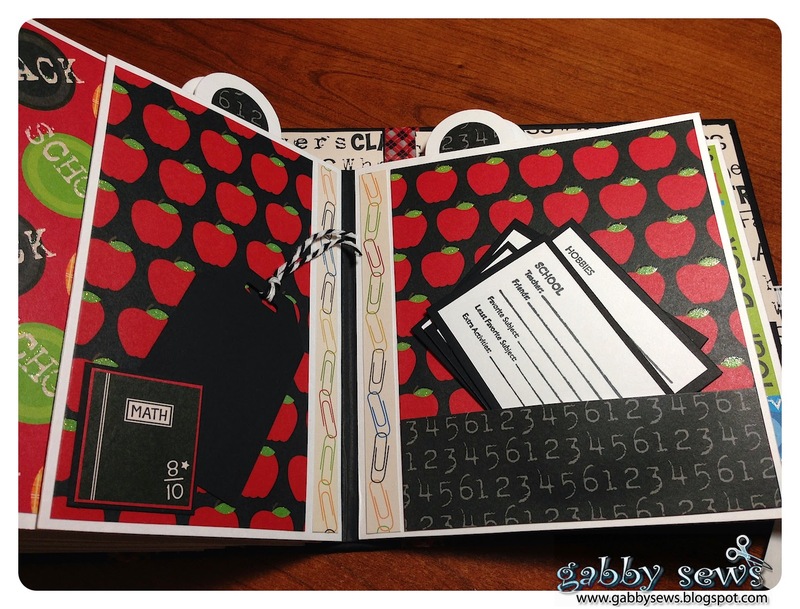 All the stamps I used in this album are from a really neat 7 Gypsies set. I picked it up at my local LSS on clearance several months ago but really had no idea what I was going to use it for. 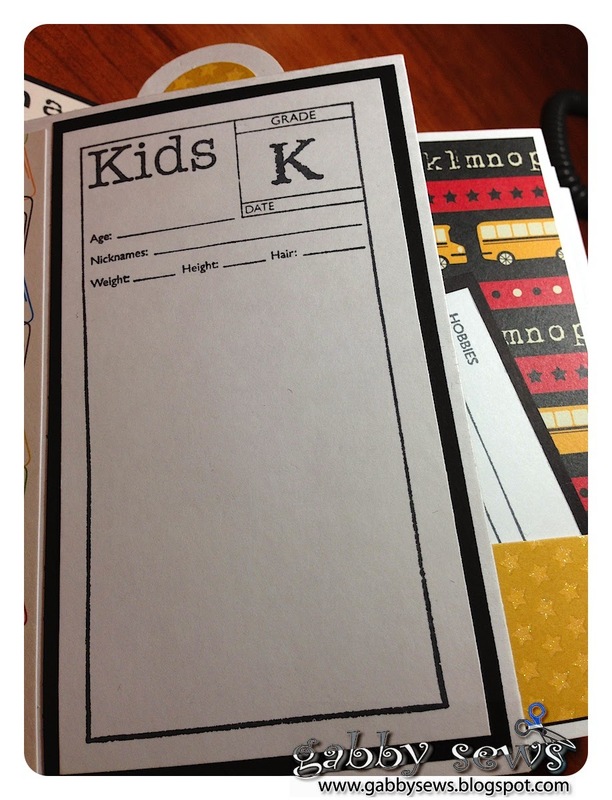 I did alter the stamp a bit by cutting off a section where you filled in the name of the child. I thought it was sort of silly to have that on there when the album itself has her name on it! The grade page is a bit smaller than the second page. I wanted to create a little bit of interest and make it obvious that the two pages went together. 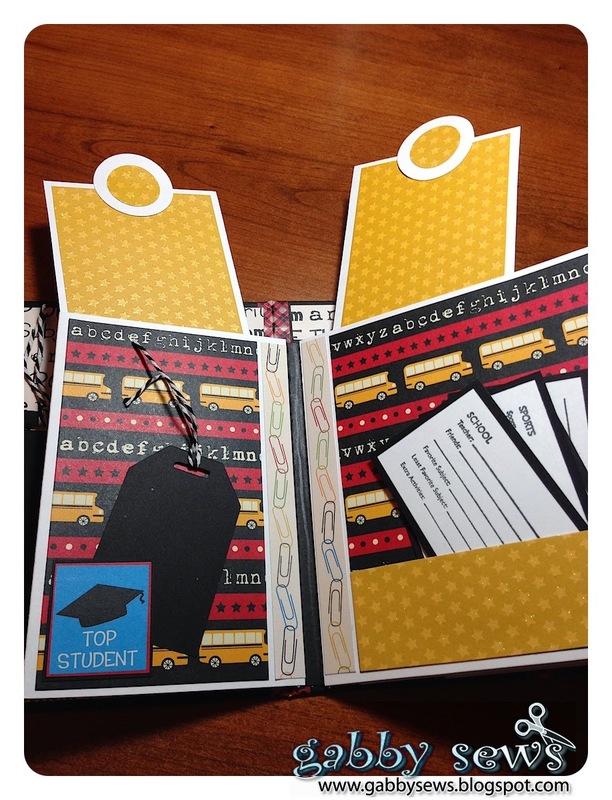 I made some tags and journaling cards for each grade that I slipped into pockets I created from coordinating paper. The journaling cards were stamped from the 7 Gypsies set and I matted them all on black card stock. On one side you can fill in the information and then the other side is available as a photo mat. One of the papers in the collection was a collage of all sorts of school related sayings and pictures. I cut one of each out and then backed them with black card stock to make them a little more stable. 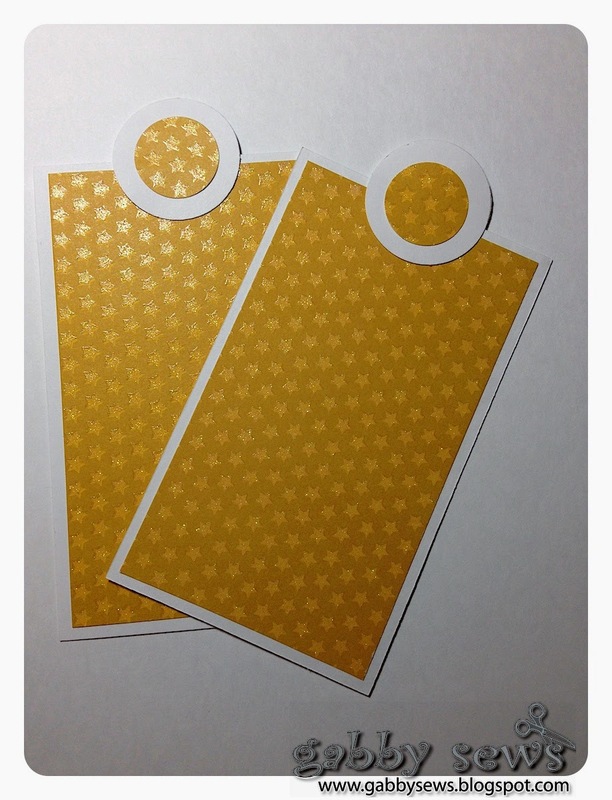 I used many of those to create little slider pockets for tags or pictures. You can see those on the back of the smaller grade page with a tag sticking out. 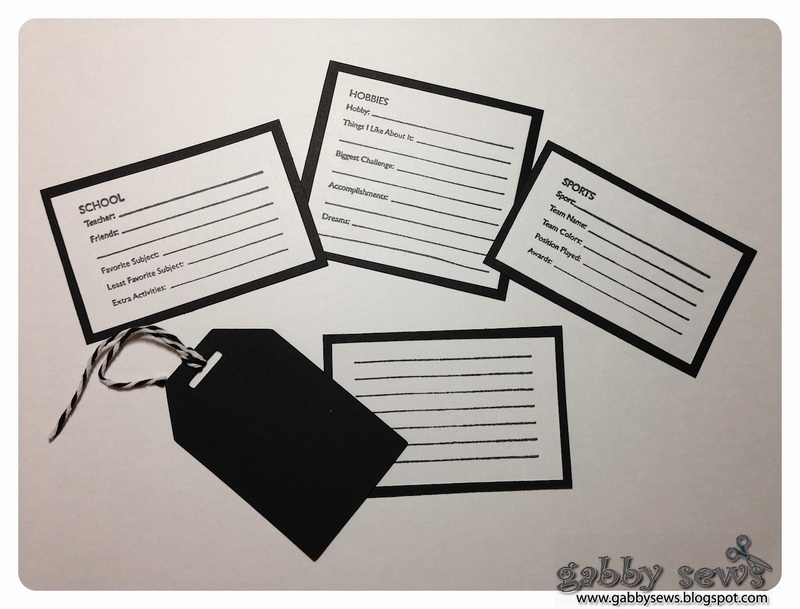 I used some Paper Studio twine to add a little decorative touch to the tags. 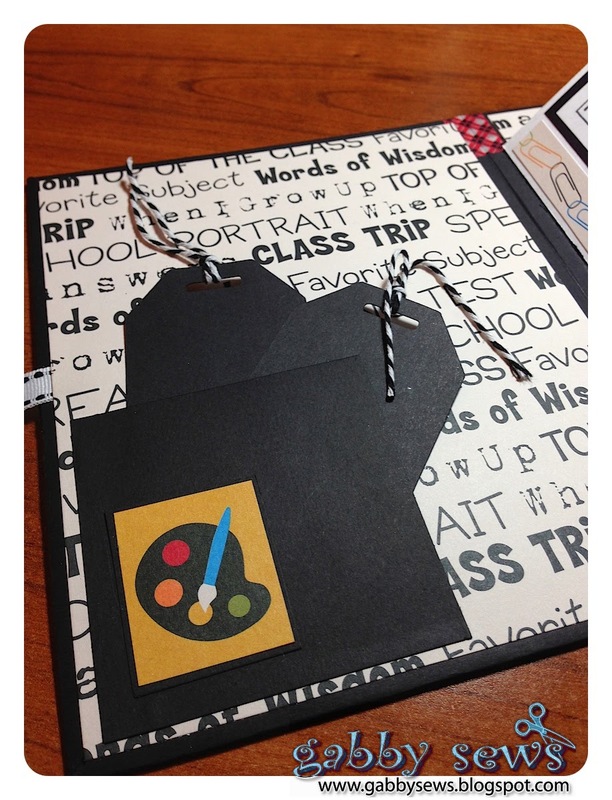 I figure the tags can be used for either pictures or journaling. 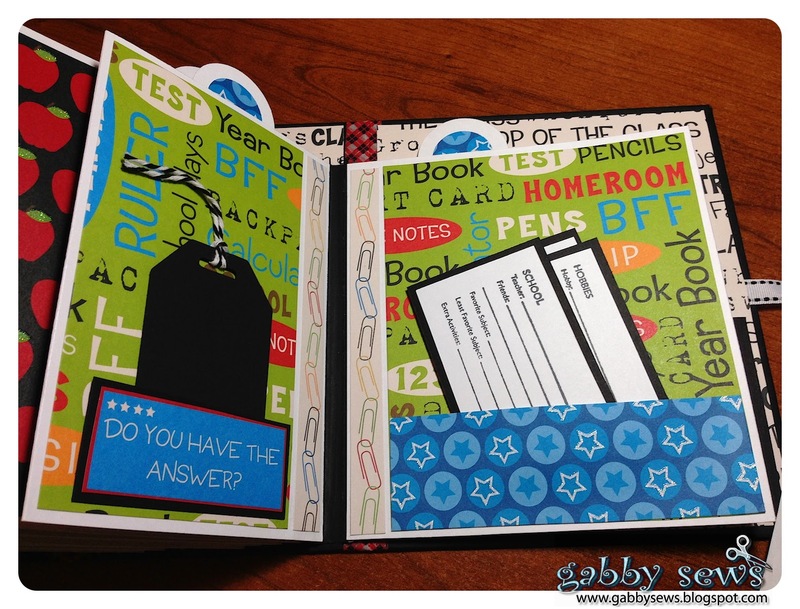 I also created two large photo/journaling tags for each grade and those slip into pockets I created at the top of each page. I used my circle punches to create little tabs that stick out the top. I used the same paper on the tags as I did on the main pocket for each section. Here are all the pages so you can see the different paper combinations I used (kindergarten is shown above as the sample). I didn't use any of the papers for more than one grade and I kept the same color mixes the same within each grade. 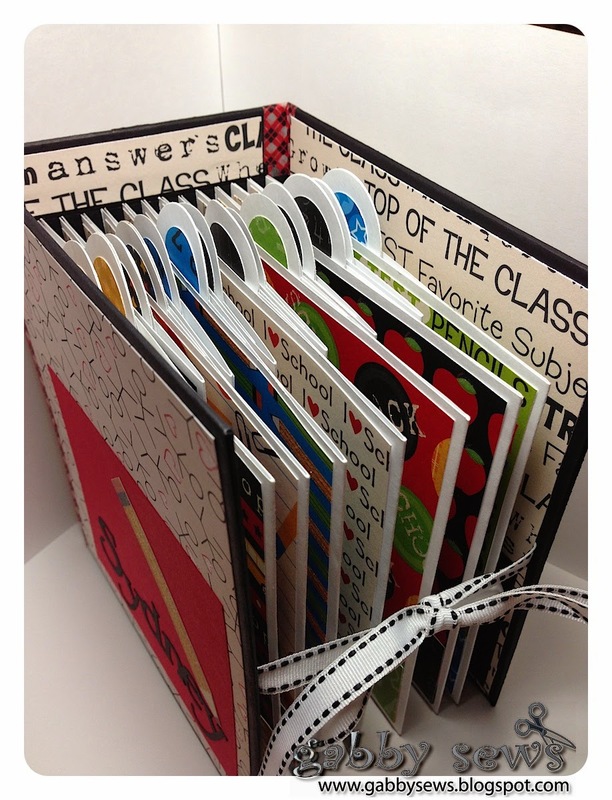 I really liked this paper collection because they all coordinated with black which made creating mats very easy! I plan to fill the album full of things Sydney tells me about school. Unfortunately we live about 900 miles apart so I don't get to see her very much. I'm hoping that as she gets older her shyness on Skype will lessen. Although she does look really cute when she tucks her head and shrugs her shoulders when I ask her questions. I sure hope she and my sister like the little album when it's all finished! 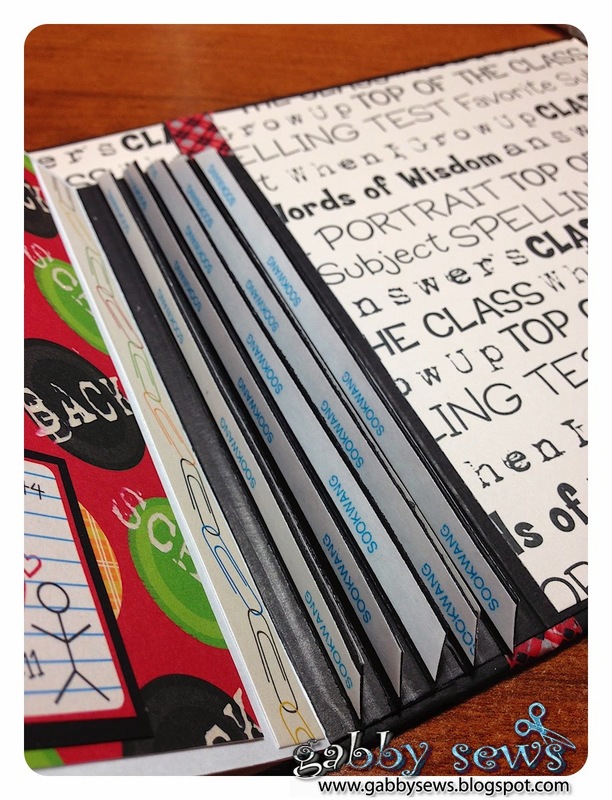 Pages - 6"x4" and 6"x5.5"
Small tags - cut from Tags, Bags, Boxes, and More Cricut cartridge at 3"
Journaling cards - 3.5"x 3.75" and 3" x 3.5"
Constructed with Scor-tape (lots and lots of Scor-tape), ATG, Aleene's Quick Dry Glue, and Zig Two-Way adhesive. This thing was an adhesive monster! I probably used about $10 worth of adhesive on it!! Oh my gosh!!!! This album is BEAUTIFUL!! Your sister will CHERISH this forever!!!! Wonderful concept design and AMAZINGLY done!!!! Hugs! !